One of my least favorite sayings is “where there’s smoke, there’s fire.” That’s about the same thing as saying “all allegations are at least partly true.” What I say is “where there’s smoke, there may be someone blowing smoke.” The smoke/fire fallacy is central to Birther math that says that if you add up enough allegations, regardless of their value, you get some level of proof. Put another way, they say that if you add zero enough times, you get something greater than zero. 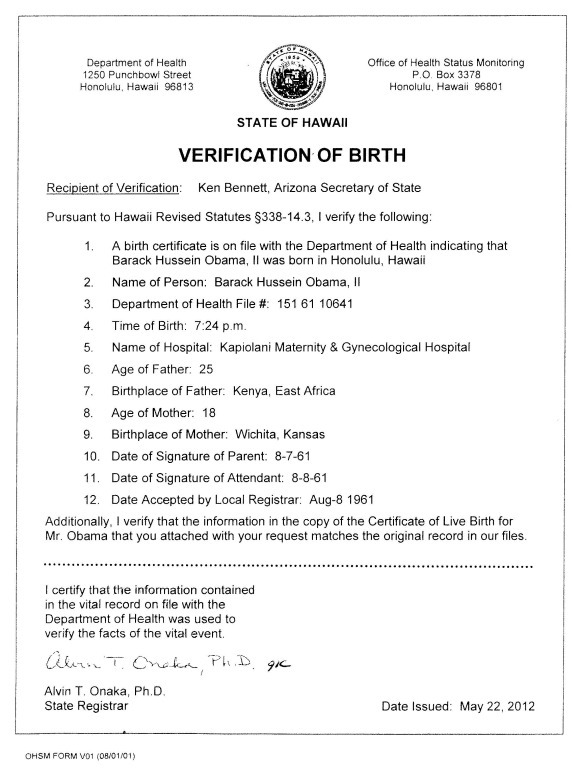 In this article, I apply the mathematical definition of zero to a A Catalog of Evidence – Concerned Americans Have Good Reason to Doubt that Putative President Obama Was Born in Hawaii by attorney Mario Apuzzo. 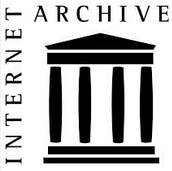 The Catalog (as of today, June 26, 2010) contains 35 items.When the original items are too long, I will not copy them here, but provide only a summary or indicate the omitted section with ellipses. The reader can (and is urged to) get the full text from link above. Quotes indicate text from the Catalog. This story is certainly ground central for the birther explosion. In the recording, Sarah Obama does say she that she was present when he was born. She doesn’t say where she was present, nor precisely who “he” is (it could mean Obama father or son). 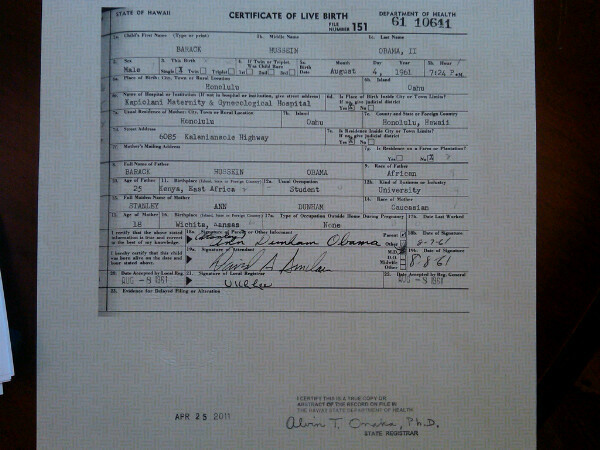 However, she clearly corrects Bishop McRae when he jumps to the conclusion that Barack Obama II was born in Africa. The translator Ogombe says on the recording: “Sir, she says he was born in Hawaii.” Links to the recording and English transcript are available in an article here. 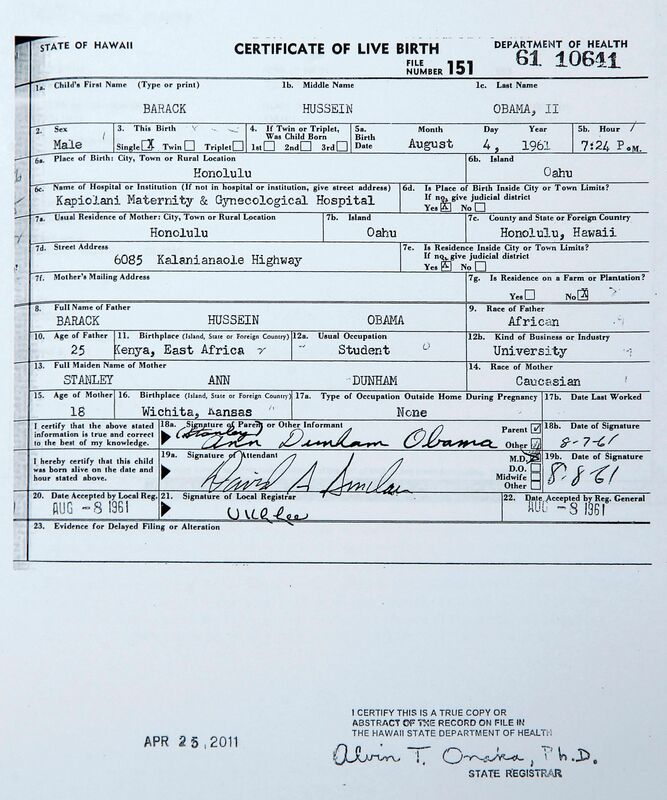 The only reason anyone believes this indicates Obama was born in Africa is that the recording was cut off before the clarification in most early published copies, and folks like Mario Apuzzo try to spin the full version to say something it does not. Bishop Kolini’s retirement is inline with the denomination constitution that mandates the bishops to retire at 65. “I think I have done my part and it is time for me to pass on the mantle I am an old man who needs to grow old a happy man because those that passed through my hands are now responsible people, I now have a reason to thank God for the gift of the ministry he imparted in my life” Kolini said. In my small way, starting in 1976, I made up my mind to educate one Zimbabwean child a year at Lander University. As I speak, fifty-eight Zimbabweans have passed through my hands. I will say to my grandchildren, dream and also implement your dream; here a little, there a little: it will add up. In the dozens of examples I looked at, not one referred to the birth of a child. One might find one, but it would be unusual. This is clearly a misinterpretation, since the “well-known attraction” is the village of Kogello, not the Coast Hospital in Mombasa. The Ambassador’s assistant, the next day, said that the Ambassador was misunderstood, and that the Ambassador had no way of knowing where Obama was born. This theme will re-occur I suspect. The testimony of someone who has no reason to know something carries no weight. A major sign of hope is embodied in Obama’s personal background as a product of at least three civilisations (American, African and Islam), with a wider multiculturalism in Indonesia, when he was a child, and in Hawaii, where he was born and spent much of his childhood. Do we see a pattern emerging? Stay tuned for Part 2. That’s a commonly misused phrase. What people seem to forget is that smoke is an observable fact. And if you see a lot of black smoke billowing about, you can be reasonably sure there is a fire somewhere, and you should probably start to get concerned. Observable facts can certainly lead to a conclusion even if the final fact is not yet readily apparent. Birthers take things that are not facts at all and assume if they repeat them enough that means something. Not only is the sum of their talking points 0, but the sum of their IQs as well. to the layperson, birther math might seem a bit puzzling and, dare i say, more than a bit silly, but trust me, this constitutional crisis of biblical proportions is adding up to the end of this country as our forefathers envisioned it. all it takes to understand that is investing just a few minutes to learn birfer calculus. doc, do you have a typo in this passage, to which i’ve added a correction? aarrgghh: I read your birfer calculus. One Russian is a playwright. Two Russians is a revolution. Three Russians is the Kremlin. aarrgghh: to the layperson, birther math might seem a bit puzzling and, dare i say, more than a bit silly, but trust me, this constitutional crisis of biblical proportions is adding up to the end of this country as our forefathers envisioned it. all it takes to understand that is investing just a few minutes to learn birfer calculus. Your article was simply awesome, aarrgghh. Thanks for providing the link here & sharing it! Big one. 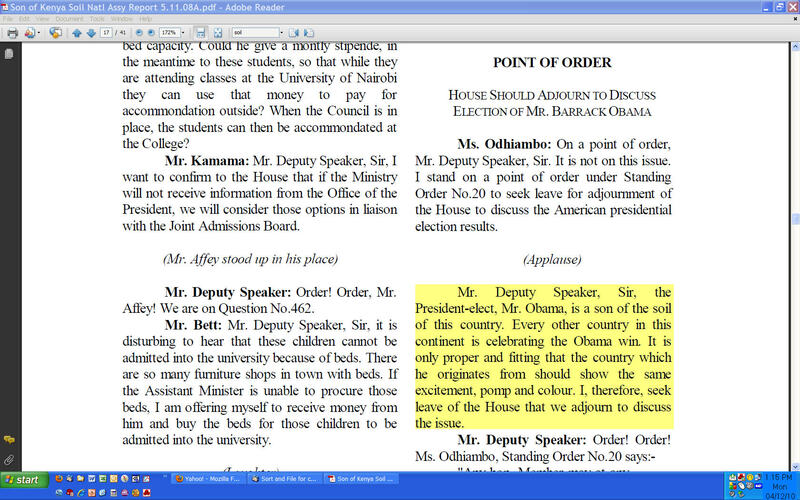 The Kenyan Ambassador said he sounded confused but he certainly doesn’t during the radio show. I’ll take his word for it. As the radio hosts put it, Who is going to argue with his excellency? 2 – Get a deposition. Anything else is hearsay. Sometimes where there’s smoke, there’s a smoke machine. Whatever4: Sometimes where there’s smoke, there’s a smoke machine. Sometimes where there’s smoke, it’s intestinal methane being lighted. Which is 100% of what Denialists expel. You must really hate America to take the word of a foreignor, who has provides nothing reason to back up his statements, doesn’t speak English as his first language, later corrects his statement (which you discount), over the clear, unambiguous, statement of a government official of a State of the United States, who says that she has examined the official state records, and Obama was born in that state. Majority Will: But never enough cowbell. Some of the newspapers articles the birthers didn’t even take the time to read. There saw the title and got all excited. misha: Get a deposition. Anything else is hearsay. Well, Your Honor. We’ve plenty of hearsay and conjecture. Those are kinds of evidence. Nice Lionel Hutz reference. 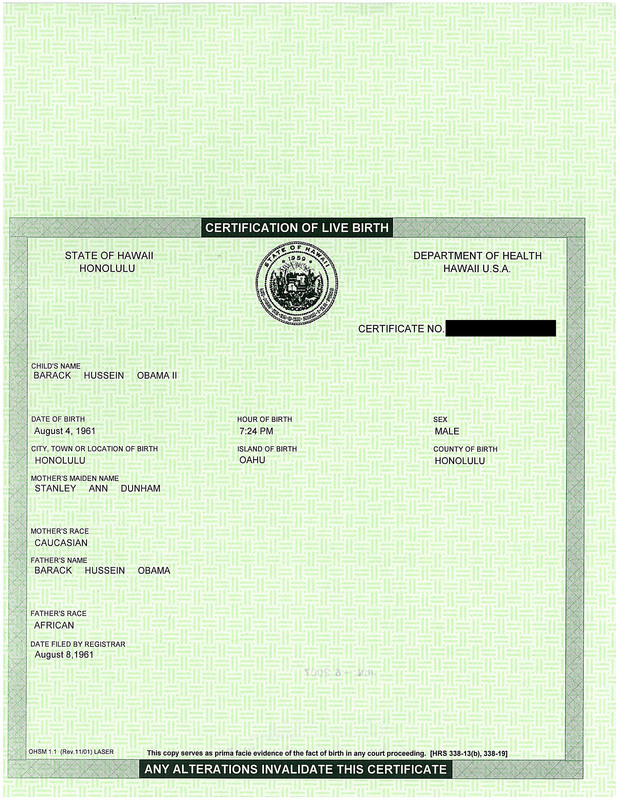 He’s a SCOTUS justice compared to these idiotic birther lawyers. At this point, any Mario post should come with a pic of good ol’ Lionel. I somehow had never seen a transcript of that conversation with Obama’s step-grandmother, even the abbreviated one, although I did listen to it at one point. The transcript really just confirms my impression of the tape, though–that that was one confusing conversation. I mean, you’ve got a whole bunch of people in the room, all talking at once, one guy trying to translate for everybody, and his English is not exactly perfect. Not casting stones, of course. He speaks English better than I speak any non-English language. But still, he was obviously struggling for the right words sometimes. And then, just to make it worse, McRae and his guy seem to be unwilling to shut up for five seconds at a time and let them talk. So yeah, even from only the first five minutes, I’d have a hard time accepting that as evidence of what Mrs. Obama really was saying. That situation is just asking for misunderstandings. The additional part of the tape just makes that more clear. Probably discussed to death already, I know. I always seem to be a little behind. As for the ambassador, if he says he was misunderstood, I don’t find that hard to believe either. Radio dude just slipped that in there all casual-like, and he wasn’t enough on guard to catch on to it. Even without translation difficulties, in the course of a casual conversation stuff like that happens, and radio guy was, it seems to me, trying to trip him up. Guys: if he was born in Kenya, and this is known, you really should be able to come up with something better than this.